If made in #10 crochet cotton angel is about four inches high. In goldfingering it is about six inches high. 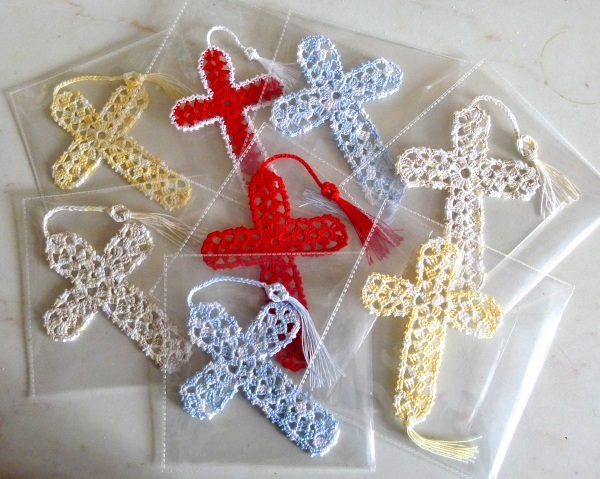 It can be used as a bookmark, perhaps with a cord and tassel or else as a tree decoration or even made into bunting. I made it as a bookmark to give as a Christmas card. I made them in all sorts of colours. The pattern includes bothe UK and US versions. Thank you! I have heard of people giving angels and did think it would work for that too. That’s fine. Takes me a bit of time to write up the pattern clearly and check it by making one. Thank you for sharing with us. I know of several on my C list who would love this. Glad you like it. I should of said for people to say if there any mistakes! I think they are utterly charming. I am almost tempted to have a go but its years since I crocheted anything so dainty. I like the idea of Grandmothers angel! 🙂 I don’t find crocheting with crochet cotton is much harder than with yarn as long as you have a good light! totally loving this pattern.. 😀 so pretty. Thanks for sharing the pattern. I try to make a few new hand made ornaments every year, and even though I’m still in summer mode, I know that time of year will be upon us quickly. Glad to find people are interested in the pattern. Thank you for your comment. 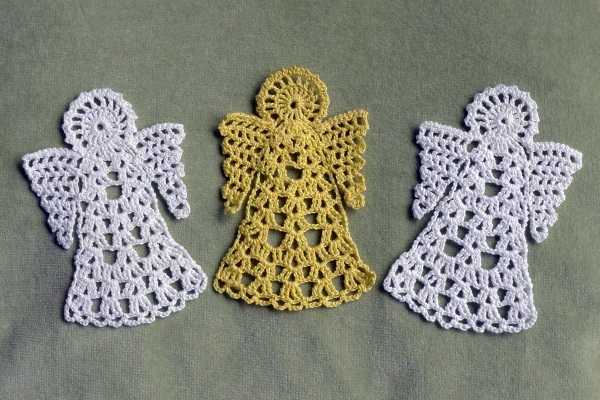 Thank you for posting the pattern, always wanted to try to crochet angels. This is a good way to give it a try and it will make great stocking stuffers. Thanks. Hope it’s easy to follow. So glad you liked it and pleased that it might help to bring comfort to your friend. Glad you like it. It is always nice to know that my patterns are appreciated! Good to hear that people like the pattern. PVA glue should make them nice and stiff for decorations! Thank you for accepting me on here,I have used a sugar/water & also a cornstarch/ water solutions then if you have to wash to clean them you can, but then again it all depends what you are using them for, I think I will try about # 30 weight cotton & go from there as to size, but not wanting it very big to put on a corner of an afgan. If you look at the bottom photgraph you will see that made in #10 thread it is about 4 inches high but made in Twilley’s Goldfingering it is almost 6 inches. Made in a heavier yarn it would be even larger. So it depends on the yarn you use and also to a certain extent the hook you choose. Maybe you could make a small part of a wing in the yarn you want to use and then scale appropriately since four rows of the wing is about an inch in thread and so is about a quarter of the height of the whole thing. Beautiful angel! I LOVE it!! I’m anxious to make some and hope to share them with friends and family. Thanks SO much for sharing your pattern! Glad you like it. Any problems understanding it just let me know. Thanks for sharing. Just found your angel. I plan to make a few of these to go in special cards for birthdays and Christmas. And some extras for myself. Glad you like it. Any problems with the pattern just ask! I would like to get the pattern for an angel tree. I go to church at an Air Force Base and we support a nursing home at Christmas. Each angel has a resident name and what clothing item they would like plus size. Requests are filled by parishioners. Previous Post Something I couldn’t show you before!